The way in. No elevator here. 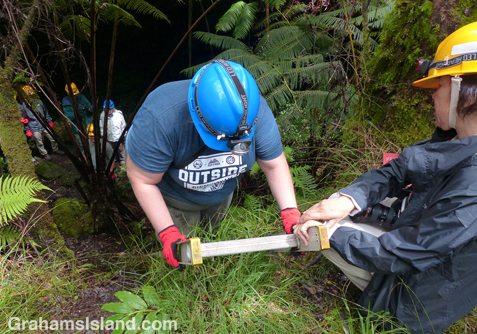 Ohia trees on the surface send roots down into lava tubes. These roots take in water from the tube’s cool, moist air. In return they offer one of the few sources of organic material and are home to a kind of cricket. A puapo’o (literally ‘flower head’) lava formation. There’s still uncertainty about how these are formed. 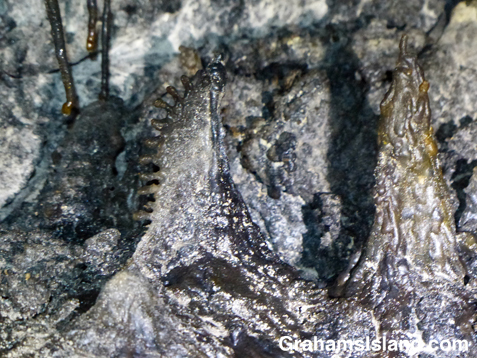 To the left are lava-sicles, the lava tube equivalent of stalactites. Mind your head. There’s a 25-foot-long low section. 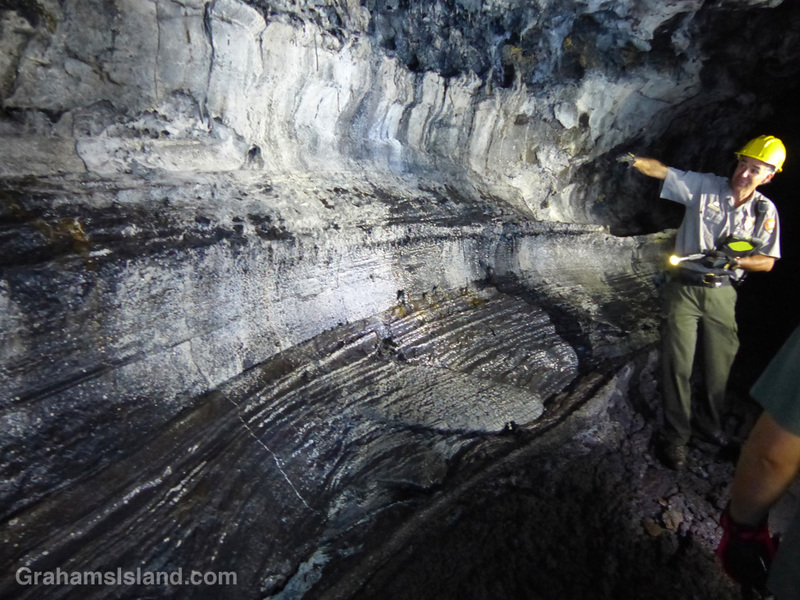 As part of the National Park Service centennial celebration, Hawaii Volcanoes National Park has been offering a guided tour of Puapo’o lava tube. This tour has been offered in the past, but not for several years. Puapo’o is a pristine lava tube meaning that its rock formations are intact and life in the tube is largely undisturbed. Contrast this with the park’s popular Thurston lava tube, where all the finer lava details have long since been broken off by visitors. There’s a hike to the tube, which is deep within a forest rich in tree ferns. The tube entrance is accessed by a ladder and then it’s on into the dark. 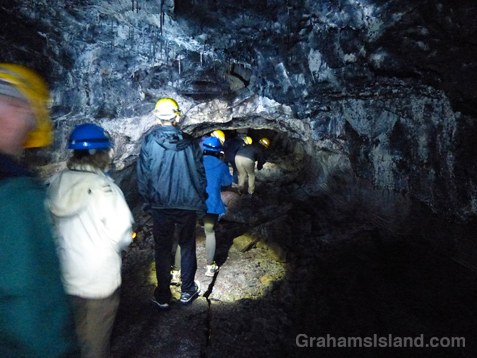 Whereas Thurston lava tube is well lit and has a mostly flat floor for easy walking, Puapo’o, which is about a mile long, was lit only by our headlamps and rocks littered the tube floor. It’s not a tour for the claustrophobic or nervous. The way out. Heading for the light. Those rocks on the floor match recesses in the tube ceiling show where rock falls have happened. A month before, one of our rangers had been leading a tour when there was an earthquake, a common occurrence in the park. The group left the tube, but the next visit found a new rock fall. 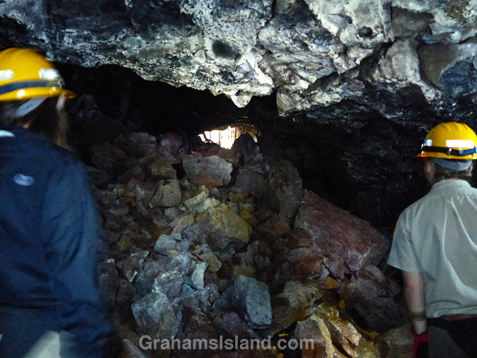 We scrambled over rocks, and sat in the dark in a large, amphitheater-like part of the tube. As we progressed, the rangers pointed out different lava formations from lava-sicles to bathtub rings to puapo’os for which the tube is named. And even in this pitch dark place, there is life – moths, crickets, and spiders, one a huntsman and the other a tiny, near invisible thing that builds gossamer webs. Also, living on the tube walls, are unique microbial colonies, which are being studied for medical uses. Eventually, we scrambled up a rocky slope and out through a narrow opening, back into the forest. 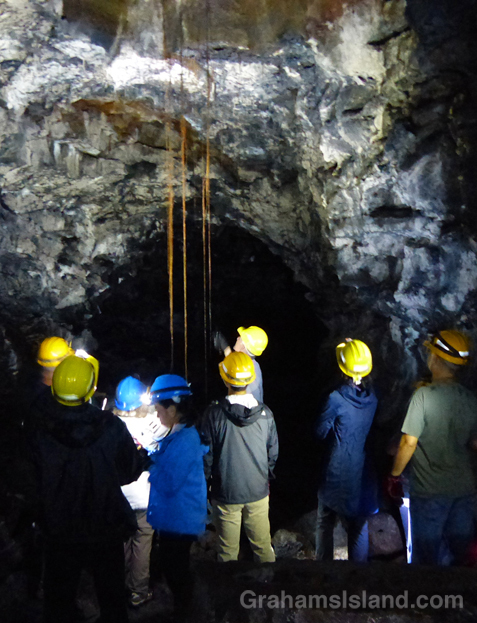 For more information about the Puapo’o lava tube tour, go to nps.gov/havo/planyourvisit/lava-tube-tour.htm. Ranger Dean points out bathtub rings on the tube wall. These indicate the level of the flow through the tube at different times.